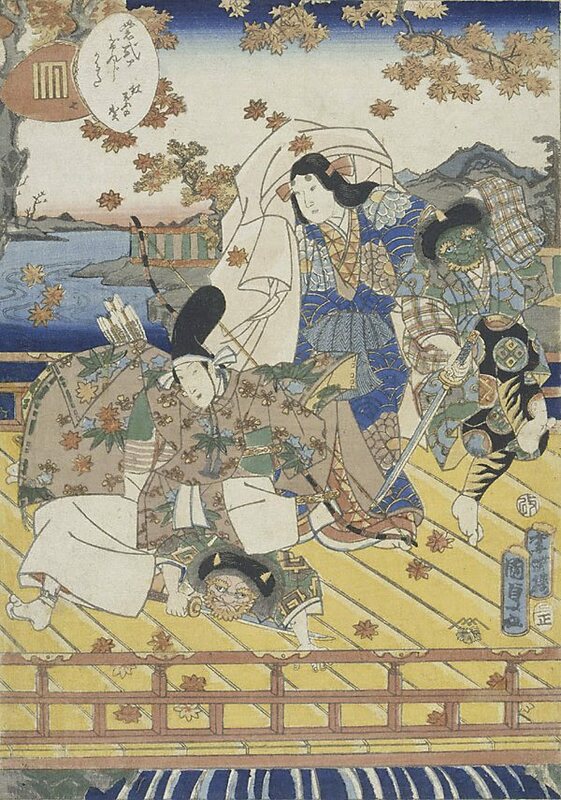 Using the best quality papers, ink and gold leaf, 'Playing cards of Murasaki Shikibu’s Genji' is considered to be Utagawa Kunisada II’s most successful series. Evoking the Heian-period court game of shell matching, 'kai awase', each print in this series is identified by two shells, one of which bears the title and the other a 'Genji-mon', a crest corresponding to a chapter of the Tale. In this series, Kunisada II relies heavily on the Genji images that his teacher and father-in-law, Kunisada, created for the illustrated book series 'Nise Murasaki inaka Genji', instead of merely transposing conventional iconography into a modern setting. Signed l.r., in Japanese, black ink "[Baichôrô Kunisada ga]".